This document is intended for Original Equipment Manufacturers and BIOS vendors creating Intel® I/O Controller Hub 9 (ICH9) Family based products. Section 1.3 provides high-level feature differences for the ICH9 Family components. This document is intended for Original Equipment Manufacturers and BIOS vendors creating Intel® ICH9 family-based products (See Section 1.3 for currently defined ICH9 components). This document assumes a working knowledge of the vocabulary and principles of PCI Express*, USB, AHCI, SATA, Intel® High Definition Audio (Intel® HD Audio), SMBus, PCI, ACPI and LPC. Although some details of these features are described within this manual, refer to the individual industry specifications listed in Table 1-1 for the complete details. 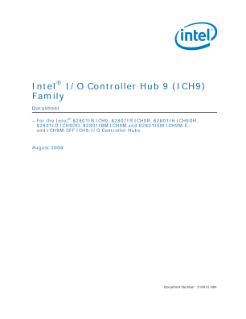 Read the full Intel® I/O Controller Hub 9 (ICH9) Family Datasheet.